Race fans on the Isle of Man were treated to a stunning finale with the Senior Manx Grand Prix providing drama and excitement throughout the four lap race. Yorkshire’s Matt Stevenson eventually put the disappointment of crashing out of the Junior Race earlier in the week, when comfortably leading the race, to win the Senior Manx Grand Prix adding his name to the illustrious list of previous winners that includes Harold Daniel, Doug Pirie, Geoff Duke, Phil Read, Nick Jefferies and Ryan Farquhar. However, he nearly threw it away with a ten second pit lane penalty for refuelling with the engine switched on and only a last lap charge, which saw him make up a twelve second gap, gave him the chequered flag from Steven Parsons. Riders enjoyed the best conditions of the week with dry roads and sun all around the Course for the final race of the 2018 Manx Grand Prix, the blue Riband MGP Senior. Irish rider David Lumsden was first away and first on the road, but he was quickly passed on the clock by a number of riders including fastest qualifier Stevenson who led at Glen Helen on the opening lap by less than half a second from Stephen Parsons on the peoplebikes.com Kawasaki. 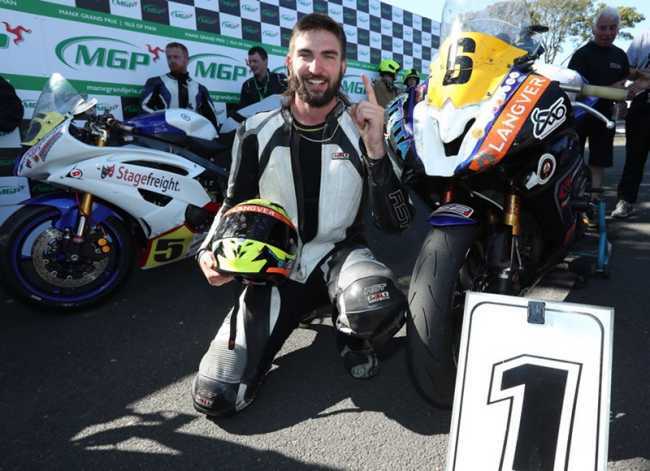 The Isle of Man’s Dean Osborne was third, less than two tenths of a second behind the second placed man with James Chawke, the Junior MGP race winner and Brendan Fargher completing the top five. There was less than two and a half seconds separating the top five as the race looked like living up to its billing. Newcomer Mike Browne was also going well in sixth after being forced to retire from the Newcomers A race when leading. Chawke was up to third at Ramsey but there was a new race leader at Ramsey - Parsons, by almost two seconds from Matt Stevenson. Dean Osborne was fourth with Brad Vicars moving into fifth with Brendan Fargher a retirement at Sulby Crossroads. Vicars was then reported to have come off his machine at Guthries – and was uninjured - which saw Daniel Ingham move into the top five. Stevenson was back in front at Cronk Ny Mona and had a lead of just over half a second from Parsons at the Grandstand with his opening lap of 119.881 to Parsons’s with Osborne almost four seconds back in third. Chawke (118.988) and Ingham (118.638) completed the top five. Parsons was back in front at Glen Helen, but it was all change again, the sixth change in the race, by Ballaugh, with Stevenson gaining a lead of less than a second. James Chawke was holding third but was already almost twelve seconds behind the leading pair. Matt Stevenson joined the Tommy Club - set up in honour of 2004 Junior MGP winner Tommy Clucas - with the first 120mph lap of this year’s MGP meeting on his opening lap, becoming the seventeenth MGP competitor to achieve that mark in the process. Stevenson’s lap gave him a three second lead over Parsons with Dean Osborne’s 118.826 putting him in third place and James Chawke (119.233) and 119.074 completing the top five a further 0.2 and five seconds respectively. However, Chawke, who was running in fourth place, lost time in the pits when his machine didn’t fire, and he dropped to sixth at Glen Helen, almost forty seconds behind the race leader. With the riders on the third lap, dramatic news came through from race control that race leader Stevenson had incurred a ten second penalty in the pits for refuelling with the engine running. Parsons was duly confirmed as the new race leader and was just over ten seconds in front at Ramsey – so would have been race leader even without Stevenson’s pit lane penalty but all eyes were on the clock as the riders headed for the Grandstand to see if Stevenson could make up the time ahead of the last lap. Chawke moved back through the field and was again up to third by Ramsey. Also going well were Steven Procter who was into fourth, 2.5 seconds behind Chawke with newcomer Mike Browne less than a further second back in fifth. Daniel Ingham was reported to have come off at Sulby Bridge but was unhurt. Parsons came through with a third lap of 113.828 to lead by 7.7 seconds from Stevenson (112.793) with Procter (113.516) the new third placed man a further eighteen seconds back. Chawke (112.617) was fourth, 1.3 seconds behind the final podium place, with Browne (113.294) almost two seconds further back in fifth. Stevenson was eating into Parsons’s lead and it was down to just over five seconds by Glen Helen on the last lap and then to only 1.1 seconds at Ramsey. Stevenson dramatically moved back in front at the Bungalow by three seconds, with only 7 miles of the race left, and clinched the race win with a last lap of 120.974 to win by five seconds from Parsons. Steven Procter clinched the final podium place with a last lap of 120.579, his first 120mph lap while Newcomer Mike Browne finished fourth with a lap of 119.788. Andrew Farrell rounded out the top five, also clocking a 120mph lap – 120.247mph. Matt Stevenson, winner of Friday's Senior Manx Grand Prix race.